Are you tired of the muted, neutral colors of your wall? Do you feel like upgrading the look of your apartment? You will be amazed by how much you can transform your space by simply updating the look of your walls. Some methods are pricier than others. The good news is that regardless of your budget, there are dozens of ways to go about it! We have prepared for you a list of inspirations. 1. This is perfect for a minimalist who wants just a splash of color! 2. It’s simple. It’s fun. It’s rustic. It’s warm. The best part? You can easily recreate this! 3. You can often achieve magnificent results through smart composition. Less is more. 5. 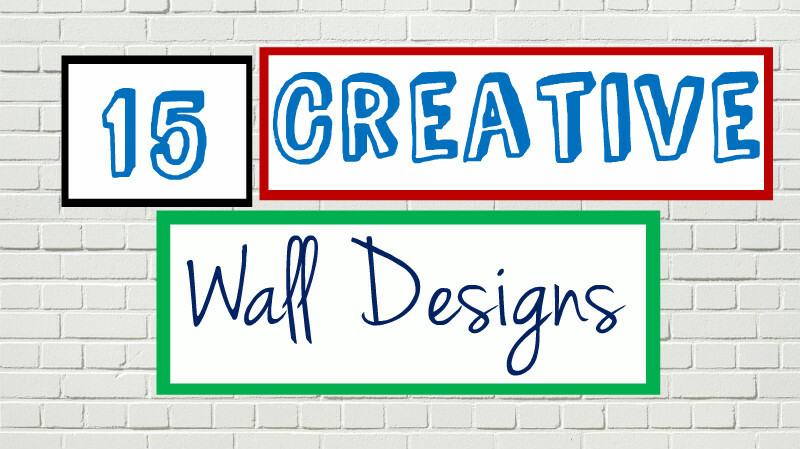 You don’t have to be an artist to create fun designs on the walls of your kids’ room. 6. You can give your wall a fresh look with just a sharpie…and some patience. 7. Don’t want a permanent design? There are plenty of options for that as well. 10. Display your adventurous, worldly side. 11. Mix different styles to create something truly unique. 12. You can use ANYTHING for wall designs. Let your imagination go wild. 13. You can find plenty of sticker options to liven up your wall. 14. Thread + pushpins. Seriously, that’s all you need to create any shapes and designs on your wall! 15. Finally, create a mini garden on your wall.